"This book is the survivor's guide for business forecasters. It covers a wide range of need-to-know topics from 'what is demand' to 'why should I trust your forecast.'" Scott Roy, Collaboration Planning Manager, Wells Enterprises Inc.
"This is a tremendous compilation from some of the best forecasting analytics and business minds of today. A reference that should be on the shelf of anyone whose job is to develop forecasts." "Finally, a book tailored to business forecasting that is comprehensive for everything from data gathering to the art and politics of explaining why we are wrong!" "In spite of my many years in forecasting and planning, the reading was so captivating that I could not stop before it was over. 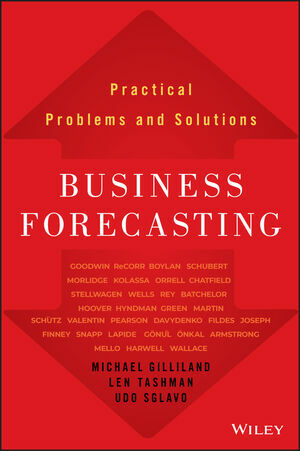 Absolutely a 'must-read' for every person working in business forecasting." "This book is a wonderful compendium of demand planning and S&OP insights drawn from some of the best minds and practitioners in the industry." "The editors do an excellent job of introducing a broad set of topics critical for deploying and maintaining a successful forecasting process within an organization." "I would definitely recommend this reader as a key resource for those looking to learn more or to have knowledge at their fingertips for that moment when they need a refresher." "This terrific compilation of writingsfrom virtually all of the big names in the forecasting communityproves that innovation in forecasting is vibrant." MICHAEL GILLILAND is Marketing Manager for SAS forecasting software, editor of the Forecasting Practice section of Foresight: The International Journal of Applied Forecasting, and author of The Business Forecasting Deal. He has published articles in Supply Chain Management Review, Journal of Business Forecasting, Analytics, Supply Chain Forecasting Digest, APICS Magazine, Swiss Analytics Magazine, and Foresight. Mike holds a BA in Philosophy from Michigan State University, and Master's degrees in Philosophy and Mathematical Sciences from Johns Hopkins University. Follow his blog, The Business Forecasting Deal, at blogs.sas.com/content/forecasting. LEN TASHMAN is the founding editor of Foresight: The International Journal of Applied Forecasting, now in its 10th year of publication. He serves on the Board of Directors of the International Institute of Forecasters and is organizer and chair of the Forecasting in Practice Track at the annual International Symposium on Forecasting. Len is an emeritus professor of business administration at the University of Vermont and Director of the Center for Business Forecasting. UDO SGLAVO is Senior Director of Predictive Modeling R&D at SAS Institute. His team develops industry-leading and award-winning software for data mining, machine learning, and large scale automatic forecasting. He has published articles in Analytics, and is a contributor to The Business Forecasting Deal blog. Udo has served on the practitioner advisory board of Foresight, and holds a diploma in mathematics from University of Applied Sciences, Darmstadt, Germany.